Without question, counterfeit watches are big business. With any high dollar, highly recognized item, knock offs are going to appear. Fakes range from knock-off iPhones, iPhone chargers, Gucci and Hermes, cologne, pharmaceutical drugs, and of course, watches, -all things with demand and dollars attached. Problems with fakes is more than the consumer perceiving that they are getting a good deal, but rather that the quality and consistency is not that of the original product and that the original company does not stand behind the product and monitor its success in the market place. The iPhone charger debacle in China is a good example. What appeared to be standard iPhone chargers are electrocuting uses in certain conditions. Clearly a safety problem caused by knock-off profiteers, the iPhone charger is one extreme example on how the unsuspecting consumer is purchasing what they think is a safe product as the original, but find out that the knock off product could potentially kill you. Fortunately, knock off Swiss watches do not have enough electricity to electrocute anyone, but nonetheless they are still a problem. Last year, the Federation of the Swiss Watchmaking Industry estimated that more than 40 million fake watches are in distribution amassing over $1 billon in profits. 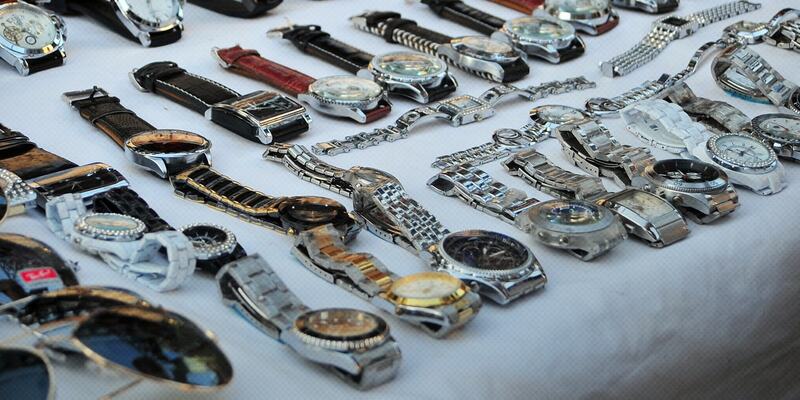 A 2011 New York court case revealed the margin fake dealers amassed when selling fake watches. Parts for fake watches costs 27 cents to import and the watches being sold for $250. One area where the seedy fake watch world and the legitimate pre-owned market collide are the hybrid Frankenwatches that both dealers and consumers don’t recognize. With the rise in consumer confidence reaching a post Great Recession high in August, the demand for high end watches increases, including Rolex. When the retail watch space gets a bump, the pre-owned watch world enjoys a bump as well. Subsequently, demand for cut-rate new or pre-owned watches increases and that is where the problems with Frankenwatches lie. Unscrupulous watch dealers take watch parts from genuine watches and sell them as parts, and replace original parts with replica parts. The watch itself appears 100% genuine on the outside, complete with genuine box and papers, but with non-genuine parts on the inside, Rolex and other companies consider it a fake. The same is true when unscrupulous dealers remove the watch face, sell it on the side, and replace with a genuine-appearing watch face with diamonds, or special painting on the dial to make it look genuine and rare. A problem with the vintage Paul Newman Daytona’s floating around the Internet is that many of the dials on them are fake. The only difference between the genuine Paul Newman Daytona watch, and the regular Daytona was the dial. A Paul Newman dial brings with it a stratospheric valuation for a rare watch face, and the reason for the many copies of the watch face installed on a genuine Rolex Daytona. So, when looking for a wristwatch, be sure that all parts are genuine and to work from a trusted dealer such as Beckertime. You don’t want to find out that your new pre-owned watch was the victim of a chop shop.